The figure I've heard on grids is power losses around 25-30%. Will factcheck later. The virtue of grids, despite the negatives Serp mentioned which I agree with, is that they distribute power from sporadic sources, e.g. on a cloudy day on the coast, Spokane can send surplus solar over to Seattle, on a calm day inland Seattle can send surplus sea breeze powe to Spokane. And there's more offshore wind energy than all land sites, so potential to put turbines where it's not keeping people awake. Funny about windmill haters....they would rather look at tall smokestacks gushing filth? To me that's like saying, I hate catching cold, but hepatitis is okay. Serpent » Tue Aug 23, 2016 8:27 pm wrote: Who wouldn't want to be in control of their own electricity? Those big, free-standing arrays are unbeautiful, but bother nobody if you put them in a field of sunflowers or a pasture; on a roof, you hardly see them at all. I guess people are so used to hydro poles and cables and grey canisters and warning signs and cherry-pickers with guys aloft, forever tinkering, and backhoes ripping out old posts and planting new, recently-dead trees, that they don't see it anymore. Somehow, I've never gotten used to that - it's so damned sloppy! I suppose, too, it hasn't dawned on most people yet that they actually can be in control, rather than just griping about their utility bills - which they do, constantly! There are whole anti-wind turbine groups because apparently these farms have destroyed some peoples lives forcing them to move because they can't handle the noise. I haven't witnessed it myself but I'm open to the possibility that it could be very bad. They say it makes them literally ill, and their cows, too. Maybe there is a sensitivity issue - and I'm not in favour of punishing sensitivity. We parked and sat directly under one of the 'friendly giants' for a half hour last summer, and were not bothered by the hum, but might feel differently if it went on day after day. There is more wrong with big turbines and wind farms, even in the desert: the grid. Miles of wires - even if buried, miles of ditch to dig. Waste. Transfer stations. Bird massacre - the Dear knows we can't spare many more! I like the look of big turbines, but not the principle. Small, bladeless and quiet is the way to go. Brain -- The figure I've heard on grids is power losses around 25-30%. Whoa! Of course, the infrastructure is aging and badly overloaded in many places. There will be more blackouts, especially in rural areas. The virtue of grids, despite the negatives Serp mentioned which I agree with, is that they distribute power from sporadic sources, e.g. on a cloudy day on the coast, Spokane can send surplus solar over to Seattle, on a calm day inland Seattle can send surplus sea breeze power to Spokane. That's all the more reason to have back-up systems, from whatever local sources are available. There is saline gradient http://salinitygradientpower.eu/project/, tidal and wave on the coast; rivers, wind, methane and geothermal inland. And, of course, there is storage - both the quality and the capacity of batteries are being improved all the time. The elephant, of course, is profligacy. The cities that obscure the sky and kill more millions of birds, really don't need to be visible from Mars. Haven't corporate executives been nagged as little children to turn off the light when they left a room? Maybe they didn't have fathers. We wouldn't need half the heating and a quarter of the cooling, if we built houses properly - and we've known this for a while now. We don't need half the labour-saving appliances and luxuries people stockpile to impress one another. Etc - you know the refrain. One green alternative to the grid is gas. If you ever get a chance, read a book on the hydrogen economy. vijay vaitheeswaran has written "power to the people". We can use existing natural gas pipelines to transport solar and wind produced hydrogen around the country. They are already injecting hydrogen into the pipeline at some pumping stations that have extra wind and solar capacity. Something I heard the other day however after getting an in person tour of yet ANOTHER hydrogen fuel cell car that is on the road right now. A professor was just telling me that he heard that hydrogen could be a problem in the atmosphere though which I find hard to believe. I would think it would combine with oxygen into water fairly quickly but he was saying it will rise up and freeze into crystals damaging the Ozone. Might just be a new myth perpetrated by the oil companies. I haven't looked into it yet. Of course if we generated hydrogen on site the chance of leaking might be pretty small. We couldn't produce it all onsite, but it could be backed up by gas stations that produce a bulk of it onsite. Having this conversation the other day with someone that worked under Governor Arnold Schwarzenegger it sounds like charging batteries directly at your house from wind or solar is the best option, then the stations for your fuel. He does this for a living and gave the argument that battery electric cars are just too heavy in many applications which is why hydrogen is the future of transpiration. Hydrogen battery hybrids. He had the Tesla owners sold on fuel cell cars by the end of the talk and tour. CORRECTION: My figure for power loss (25-30%) was based on figures which include losses inside a fossil fuel power plant, as well as on the grid. Serpent's 6% figure, for power lost in transmission and distribution, agrees with the U.S. DOE computations. I have wondered if transporting hydrogen, instead of electrons, would reduce some of the grid loss....or does hydrogen's knack for leaking through seals (it's a tiny molecule) mean the losses would be similar? As with the power grid, that would point to what Z. just mentioned, that having your hydrogen source as close as possible would reduce losses. I can certainly see efficiencies in driving my fuel cell car to the nearest windmill, to pump the hydrogen it's producing right there. Oh yes. Even with our home system, we were careful to keep the distances as short as possible. For one thing, the cable is expensive; for another, we need maximum efficiency. The array is about 10 meters from the storage shed where we keep the converter and batteries (in a big upright freezer, which was convenient but wasteful, drained and laid on its back. ), then another two meters across the back porch to the house. Monitor is right by the back door, so we can always check the power status. Keep everything on power bars with switches: both electronic devices and appliances waste like crazy when not in use. Lots of people think they've turned off the microwave or tv, but it's still guzzling electricity. There is no shortage of innovation. If only it hadn't been held for a century, we'd be saved by now. I would advise writing your congressional reps and asking them to lodge protests against Trump's appointment of a climate change denier and businessman with oil industry ties to helm the EPA. Also, we should continue to honor the Paris accord. There are already petitions you can sign on the whitehouse petition website. And today there is a protest of thousands trying to change the direction of energy in the US. I myself am leaving to my first every protest in a few minutes. I never thought I would find myself protesting because it's so hard to be educated enough to feel comfortable protesting but I have done tons of research and this is something I must do. It's not just a global warming issue, it's human rights and civil rights in our country too. This editorial touches on the DOE's role in alternative energy technology, and what direction Rick Perry, as the new Energy Secy. could take on promoting alt energy sources or on maintaining the status quo. Also asks if he will focus on promoting a climate change denial platform, or work on the real problem that faces all of us. Very helpful in getting us to an understanding carbon flux. At what point might oceanic absorption end, due to saturation? It's a vital question. Also, could there be sudden "CO2 events" where ocean areas have sudden release of dissolved CO2 due to temperature changes or other factors? What happens if deep cold water, saturated with CO2, is pushed to the warmer surface by changes in major currents? Braininvat » Sun Dec 25, 2016 10:24 am wrote: What happens if deep cold water, saturated with CO2, is pushed to the warmer surface by changes in major currents? 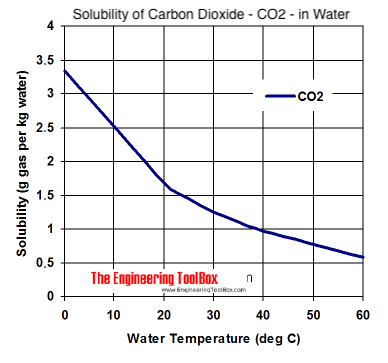 Then there is a release of CO2 I imagine since warm water can't hold CO2 as well. That's what I was getting at. CO2 bursts, like that lake in Africa, but on a more massive scale. That was a fascinating link Zetrique. I applaud the technical expertise in producing the video. The thing that astounds me about this current video clip is that the entire range of readings producing such a range of colour variation was only 18 ppm volume dry air. There was a range of variation (not SD) of only 9 ppm around the mean. Most of the swirling of the gas is due to the swirling of the underlying planetary image as far as I could make out. I have to apologise again for maybe seeing things differently from most people, but I get the impression that this video clip indicates a degree of stability in the degree of mixing of carbon dioxide around the globe. Actually it reinforces data that Charles Keeling produced 56 years ago. I did a screen dump of a Table published by him in 1960. Keeling demonstrated an 11 ppm vol dry air variation worldwide in the late 1950s, even including samples taken from aircraft flying at 5 to 6 km altitude. I'm not sure that the above video clip provides anything new, but I do admire the technology. Just watched his entire 2 hour presentation. It gives a person a lot to think about and a lot of stuff to be aware of going forward. Once again, humans are trying to fix the symptoms and not the cause. If you can't make it through the entire two hours. I highly recommend Skipping to 1 hour 38 minutes and watch through to the ending. That's when it all comes together. He is working in controversial territory but I give this guy massive credit for following through developing the tool in order to prove his hypothesis and sounds reasonable. But not just that, to help bring more awareness and education together about the planet and the world around us. Analysis of coal industry, and reasons that any regulatory changes may make little difference in the transition to natural gas and alt-energy production. Can we prevent climate change? No, climate change is inevitable. That is not really the question. The question is, what can we do to help the problem so we don't get change quite so quickly? Quickly = deadly disaster for it does not give us the time we need to adapt. I happen to think the idea for dealing with this problem by reducing CO2 emissions is completely wrong. Before I explain, I should get a few basic facts out of the way. Is man having an impact on the climate and CO2 levels? Yes and we have been for a very long time, starting with farming which reduced the amount of wetlands. However, the atmosphere of the Earth is a product of the biosphere. The levels of CO2 and O2 are a part of a natural cycle. We get large influxes of CO2 from volcanoes and forest fires. For these reasons I cannot believe that human CO2 emissions are the real problem. The real/biggest problem is the means by which the CO2 is converted into O2, and the most important is the plankton of the oceans. Obviously we thus have reason to suspect that ocean pollution is not helping. But I think the number one culprit in the rise of CO2 levels is an older problem that has been dealt to some degree with but not sufficiently. It is the damage to the ozone layer by chemicals such as fluorocarbons and those with chlorine and bromine. This lets in radiation which kills the plankton. We have significantly reduced our emissions of fluorocarbons, but the damage to the ozone layer remains, so the measures we have taken are not enough. It's worth considering, especially given that phytoplankton can be temperature sensitive as well as UV sensitive. This could cause a negative feedback cycle, where more CO2 rise means oceanic waters heating up, in turning killing more plankton, in turn meaning even more CO2 going unconverted, etc. In your scenario, a primary focus for remediation would be humans finding ways to massively increase photosynthetic organisms that absorb and then have an end-of-life cycle that fixes carbon. Could this be a positive path for genemod tech? Design more UV and heat resistant plankton varieties? I suspect, longterm, that both absorber technologies like that, AND reduced emissions strategies will be part of the overall picture. National Park Service prints new climate change brochure for select parks. It was encouraging to hear that the some measurements indicate the ozone layer is healing. Another hopeful note is that C02 emissions seem to be leveling off. But then a new threat to the ozone layer has arisen recently in the form of dichloromethane, the concentrations of which has doubled. It should be noted that any delay in the in the healing of the ozone layer could be lethal, for as long as it remains open the conversion of CO2 to O2 remains impaired. And the fact is that, overall CO2 levels continue to rise. Of course, deforestation and the pollution of the ocean isn't helping either. In this study of UV effects on phytoplankton, there are two worrisome points. First, UV exposure drops the yield of photosynthesis by 71%. Second, most of the phytoplankton is found on the continental shelves in the polar areas. This means that the ozone holes over the poles are also right over where most of our conversion of CO2 to O2 is going on. Last edited by mitchellmckain on September 1st, 2017, 4:56 am, edited 1 time in total. mitchellmckain » Fri Sep 01, 2017 4:34 am wrote: It was encouraging to hear that the some measurements indicate the ozone layer is healing. Another hopeful note is that C02 emissions seem to be leveling off. But then a new threat to the ozone layer has arisen recently in the form of dichloromethane, the concentrations of which has doubled. It should be noted that any delay in the in the healing of the ozone layer could be lethal, for as long as it remains open the conversion of CO2 to O2 remains impaired. And the fact is that, overall CO2 levels continue to rise. Of course, deforestation and the pollution of the ocean isn't helping either. The latter part of this post sounds slightly alarmist mitchellmckain. Could you please supply the original data or some sort of references that we can check? What in particular do you find alarming? Seems to me there are both points of hope and alarm at the same time. I would recommend googling any of the things in my post to check on them. You should do this independently instead of just going to my sources anyway. I found this latter statement slightly alarmist mitchellmckain - " It should be noted that any delay in the in the healing of the ozone layer could be lethal". I would have liked to see some evidence and reasons to explain the possibilities of this further, but if it's too much trouble to cite sources or references, it doesn't matter. I've just been musing on how many times, since 1976, some of us pessimists have been told that we sounded "too alarmist" about something that came to pass ten or twenty years later. Since the function of an alarm is to wake people up, or alert them to some danger upon which they still have time to act, and since they have not done either, we evidently haven't been nearly alarmist enough. Now, we're merely "hysterical", with no chance whatever of affecting the outcome. That was a really interesting presentation, zetreque. It did nothing to mitigate my pessimism, but made me feel a little better about the intelligent life-forms on this planet. doogles didn't quote the whole sentence which would have been far more helpful. mitchellmckain » Fri Sep 01, 2017 12:34 am wrote: It should be noted that any delay in the in the healing of the ozone layer could be lethal, for as long as it remains open the conversion of CO2 to O2 remains impaired. This statement puzzles me too. While not having a ozone layer is lethal in that it allows more UV to reach the surface damaging life, DNA, and cells, I am not aware of the reactions between CO2 to O2 related to ozone. O3 (ozone) protects Earth from UV light. That's why it's most important as far as I know. What happens is if you put other chemicals, dichloromethane, into our atmosphere they have these free radical reactions that interfere with the O2 O3 cycle. That cycle absorbs and protects us from UV light. So the only thing I could come with about the above statement is that without O3 in the atmosphere more UV light reaches the surface and impairs plants converting CO2 to O2. But back to the overlooked concern that is rightfully talking about the lethal threat, where (which industry or animal [abundance or lack there-of]) is upsetting the dichloromethane levels? For the connection between the ozone layer and the O2 to CO2 conversion you just have to read the thread. I even linked the article about UV effects on phytoplankton where most of that conversion happens. As for the word "lethal," see Braininvat's post about the temperature sensitivity of phytoplankton, which is also made obvious by the distribution of phytoplankton concentrations mainly at the poles. I have little doubt that the whole system will recover eventually but as I explained in my first post, this is all about preventing rapid climate change which can exceed our ability to adapt to without considerable losses. I suppose for many it is all about monetary costs and for them the point is that this could get prohibitively expensive if we are not careful. We need to react to this dichloromethane before it does even more damage to the ozone layer. Some are worried that this may already have delayed the healing of the ozone layer by up to 30 more years. Nobody knows how many more years of CO2 concentration increase we can take before the ice caps melt and we lose all our coastal cities. Whether you measure this in terms of human life or economics, don't you think that merits the word "lethal?" My apologizes I missed this part because I got sidetracked by someone else missing the point. So I was close to right in my thinking. Here is another source for "lethal" affects of less ozone. Lethal effects of short-wavelength visible light on insects. I might make an assumption that something going on with alga possibly due to algal blooms but could be something to do with UV would be increasing dichloromethane levels. That's my guess if someone wants to investigate that. I managed to follow up mitchellmckain’s post and the word ‘lethal’ will not be mentioned. Apparently a paper was published this year in Nature Communications by Hossaini et al on The Increasing Threat to Stratospheric Ozone From Dichloromethane. You can see the full text on this site, Nature Communications DOI: 10.1038/ncomms15962 . These graphs tell the story. Graph a) shows the measurements of dichloromethane in the northern and southern hemispheres up to 2015. There are a couple of points to note. The concentrations and the increases are different in the two hemispheres and they appear to be measured in parts per trillion (ppt?). The authors claim that the difference in hemispheric concentrations is most probably caused by a large increase in the industrial use of dichloromethane as a solvent in Asia and the subcontinent as well as other industrial applications. Graph b) shows the percentage increase each year and c) shows possible increases up to 2050. I checked on the site about phytoplankton mentioned as a reference by mitchellmckain. If you can’t find his link, click on http://photobiology.info/Hader.html . I thought it was an excellent dissertation on the biology of plankton. I see causes for optimism, but not complacency. Firstly the hole in the Antarctic ozone layer is closing and this means a diminishing, rather than increasing exposure of our southern oceans’ important plankton to UV wavelengths. Secondly the main build-up of dichloromethane appears to be in the region between 30 and 60 degrees Latitude N, and curiously, if the information in the above paper is correct, the gas does not appear to be mixing universally as does carbon dioxide. So the Antarctic seems to have a slight reprieve on this evidence alone. “Fortunately, cells have developed powerful mechanisms to identify and repair these UV-induced lesions. One of the mechanisms involves an enzyme (photolyase) which uses the energy of a UV-A/blue photon to break the dimer. Following the frequency of dimer formation in a population of planktonic organisms shows a drastic increase during daytime, especially if the organisms are located close to the surface. In the late afternoon and evening hours these lesions are repaired. The leftover lesions are then repaired overnight using different molecular mechanisms (e.g. excision repair). A critical situation arises when there is a carryover of lesions not repaired before the next exposure, so that there is a build up of dimers in the genetic material. In conclusion, if the Montreal Protocol participants add these other minor chlorinated hydrocarbons to their list of ozone-depleting substances, I believe we can all sleep a tiny little bit better each day. Should one of us phone them? Zetrique, I found that article on blue light and insects intriguing. The sensitivity to blue light must be to in the order of deep blue wavelengths and not sky blue – for obvious reasons. Do you know off hand if any blue lights have been tested as repellents? All I know is my dad bought this bug zapper thing about 30 years ago that has been in storage. It emits a dark blue/purple light. It acts as an attractant to an electrical coil that electrocutes them. I'm going to throw it out as I already personally feel like the insect populations are disappearing around where I live over my lifetime. I remember having to clean the windshields of our vehicles all the time from bugs and now we rarely do. Would be interesting to see some data on insect changes around where I am over the past 30 years but I don't think anyone in my area was studying that so long ago as the population was a fraction of what it is now.